As many have likely heard at least once, honeybee colonies in the U.S. have been collapsing at growing rates over the last decade, and pesticides are suspected to be a major culprit of these colony collapses. This includes fungicides, herbicides, and insecticides. Many scientific studies have looked at these pesticides separately rather than investigating the effects of multiple exposures, but a new study, published in the journal Nature Scientific Reports, is now taking this into account. Researchers are finding the number of pesticides, regardless of dose, affect colony life. This also suggests that fungicides, which many originally thought were safe for bees, also tie in to colony deaths. The study’s researchers followed 91 colonies owned by three separate migratory beekeepers for a season. The colonies began their journey in Florida and moved up through East Coast pollination crops along the way while also spending time on honey production and upcoming pollination contracts. During this traveling, 93 pesticides were discovered, which accumulated in the wax, the processed pollen (or bee bread), and the bodies of nurse bees. At each stop, the researchers tallied the number of “relevant” pesticides and the colonies’ “hazard quotient,” which is a measure used to integrate the hazard posed by toxicity of pesticides in each colony. All these measures correlated with high rates of colony death or queen failure. They also found anywhere from five to 20 pesticide residues in the bee bread, which exceeded the hazard quotient threshold. 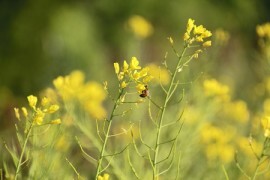 The stops for honey production gave the bees respite from the pesticides. Fungicides are highly suspected to have led to the increased mortality of bee larvae, and they can have toxic effects on colony survival in a field. Another study suggested that particular mode pesticides also lead to higher colony death. Fungicides are closely linked to queen deaths and colony mortality.